I've never really bothered with the AF/AE lock and am not really sure what it does. There's a button that says AF/AE lock; there's a menu item that says Quick AF; and there's another menu item called AF/AE lock with the option of choosing either AF or AE or both. Can someone give me a quick run down on the use of these settings? If, as an example, you want to focus on a particular subject, but then recompose the picture to have the subject off to the side, you would use the AF lock. Similarly, if you were doing a backlit portrait, you could zoom in on the face and lock the exposure, then recompose the shot and have the face properly exposed. (and the background washed out) In the case of the portrait, you might want to lock both. Sometimes, when taking a series of shots of a moving object, AF lock will let you shoot more rapidly than if the camera had to refocus every time. Not sure about the Quick AF. Perhaps it loosens up the focus requirements to keep the shot to shot times down, at the expense of a little sharpness. Last edited by Ozzie_Traveller; Apr 8, 2019 at 4:59 PM. Yes, OK. I get it. That means that all of your shots are exposed at the same level as the first one. I can see that. I guess what I'm somewhat confused about is why one would lock AF. 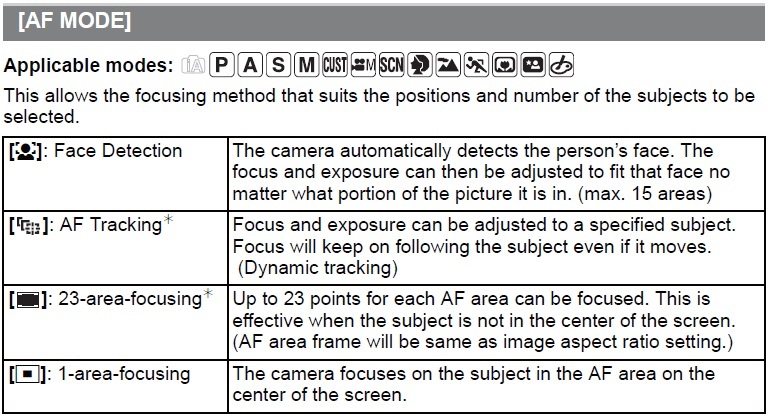 I'm assuming that AF lock would lock your focus point at a distance the same as the object you originally focused on? I'm not sure where I would use that. I'm assuming that the AF lock would lock the focus at a particular distance from the camera, or ....... does it keep the object that it's locked on in focus, regardless of it's distance from the camera? If that's the case, it would be great for following a particular horse in the race, or a bird in flight, or anything moving ..... and negate the need to continually refocus. AF lock just locks focus at a certain distance. It doesn't lock on to a particular object. Some versions of AF/C will attempt to do that, but I'm not sure that all cameras do. My Pentax DSLRs will do it, at least with some things I've tried. Generally, the object would need to be fairly large, in focus for the first shot, and have sufficient contrast with the background. So, are you saying that, as far as you know, AF lock on the FZ150 does not lock onto an object? Last edited by Shinnen; Apr 10, 2019 at 8:41 AM.